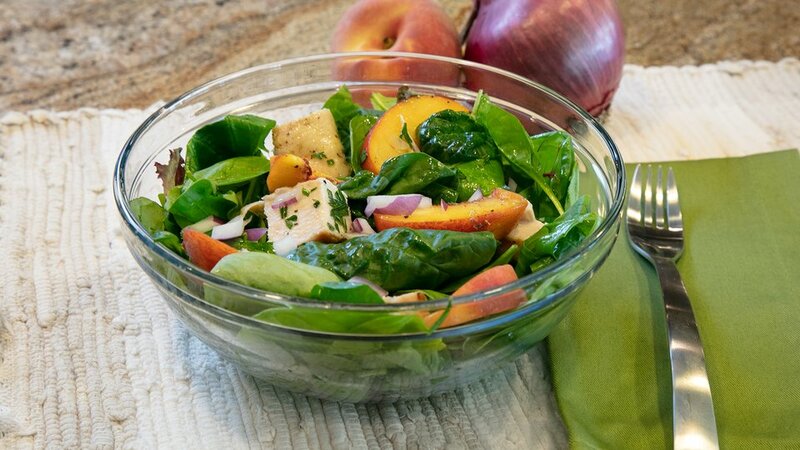 Chicken salad isn't a new combination, but you don't often see it paired with peaches! This fresh, summery salad combines antioxidant-packed greens with red onion, parsley, and tarragon, and can be enjoyed any time of the year. Peaches are low-calorie, but still pack a good dose of vitamin C and beta carotene. However, if you aren't a peach fan, feel free to substitute with nectarines, plums, berries—whatever your favorite fruit may be! All fruits are great sources of essential vitamins and minerals. Mix the olive oil, white wine vinegar, salt, and pepper in a small bowl and set aside. Toss the spinach and greens in a large bowl and add the parsley, tarragon, onion, and chicken. Add the fresh sliced peaches and drizzle the dressing on top.